If you are in the New York area, or can get down to N.Y.C. 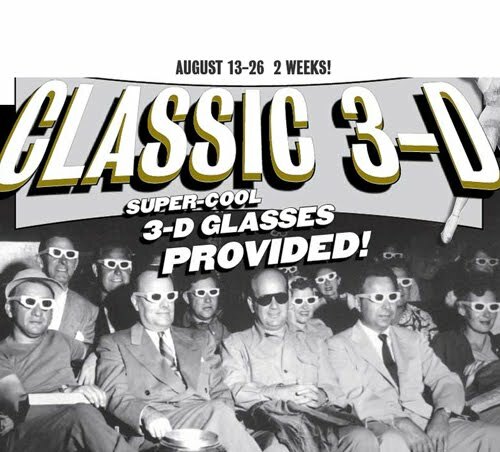 and you're a fan of 3-dimensional pictures you have to head on over to the Film Forum to check out their Classic 3-D Festival running for 2 weeks starting on the 13th. This Friday!! While a number of these films, like House of Wax and Dial M for Murder make the 3-D Festival circuit with a number 80's fair (sadly Friday the 13th Part 3 in 3-D will not be opening the festival), the Film Forum will be including a number of rarer films, such as one-eyed film-makers Andre deToth and Raoul Walsh's western's The Stranger Wore a Gun and Gun Fury. An a rare example of Film Noir 3-D Man in the Dark will also screen. (I plan to review of the first Mike Hammer film, I, The Jury, also a 50's 3-D film, in an upcoming posting of this blog, likely around Christmas of this year.) No screening of Bwana Devil the Arch Obler film that started the whole 50's craze, but then you can't have it all. 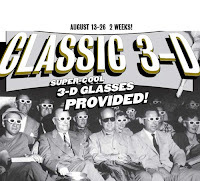 William Castle's 3-D films will also be featured in September as part of a tribute festival to the master of movie showmanship.